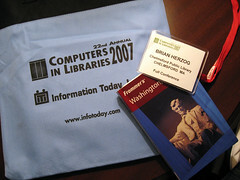 Posted under Conferences, Library, Resources, Technology on Tuesday, April 17th, 2007 at 12:19 am, by Brian Herzog. Post and comments available via the RSS 2.0 feed. Both comments and pings are currently closed.